GroupXpress is an easy-to-use, low-cost group booking application that functions both as an in-house and online group reservation system. First, load your trip info including group flights, group hotels, and other trip components into the GroupXpress tour software. The in-house, or Intranet component allows you to manage customer info and reservations entered by your agents, while the consumer-facing reservation app allows your customers to independently register for trips and make payments via your company web site. This tour booking software is web-based which means that your staff can access it from anywhere on a computer or mobile device, and view real-time up-to-the minute trip data including availability! We've scoured the Web for other group tour reservation software that is comparable with regard to functionality, ease of use, and price, and we boldly claim that no other tour booking app comes close! If you are launching a new group travel business or expanding an existing one, GroupXpress should be your group booking app of choice. GroupXpress' super intuitive booking interface allows your customers to register online 24/7. Even if your trip has multiple flights, hotels, cabins, or other choices, your customers can independently make their reservation, pay, and print the confirmation and itinerary. Process payments through the GX system in a fully secure, PCI compliant environment. Customers can pay online when they book, GX keeps track of all balances and amounts due, and customers can log in at any time from their emailed confirmations to make more payments. GX keeps you informed during the booking process, through reports and by consulting the trip detail, of how much of your inventory is sold. But it does more than just track numbers, it also prevents overbooking, and automatically inactivates a trip, or a trip component, when the inventory is depleted. Translation, GX Inventory tracking = peace of mind. Managing a reservation is quick, easy and straight to the point. A customer calls to change the room selection? No problem; open the reservation, and go straight to managing the room in question. Confirmation is updated, reports automatically reflect the changes, inventory and prices are adjusted, you look great to your customer, and feel like a million bucks. Need a Rooming report, a Flight manifest, Check your Sales & Balances, Verify your inventory? We have a report for all that, and more. Reports can be generated in PDF or in Excel format and have multiple filtering, grouping and ordering choices. Getting the data in is simple, but we also get the data out in a meaningful and polished way. GroupXpress allows your consumer booking site to replicate your company website. Or, customize each trip presentation with the included web templates or your own banner. Whether you offer cruises, bus trips, sports, faith-based or other specialty-themed trips, we've got you covered! GroupXpress is responsive. It is 100% functional on your Desktop, Laptop, Tablet, and Smartphone. If you are connected to the web, and have a Web browser, you can use GX. GX has an intuitive interface that requires no training. 85% of the tasks can be completed without even consulting the included Help system. But group travel, as you know, does have some complex operations and GX has broken those down into manageable, easy to follow, steps. Reporting Need a Rooming report, a Flight manifest, Check your Sales & Balances, Verify your inventory? We have a report for all that, and more. Reports can be generated in PDF or in Excel format and have multiple filtering, grouping and ordering choices. Getting the data in is simple, but we also get the data out in a meaningful and polished way. Customizable GroupXpress allows your consumer booking site to replicate your company website. 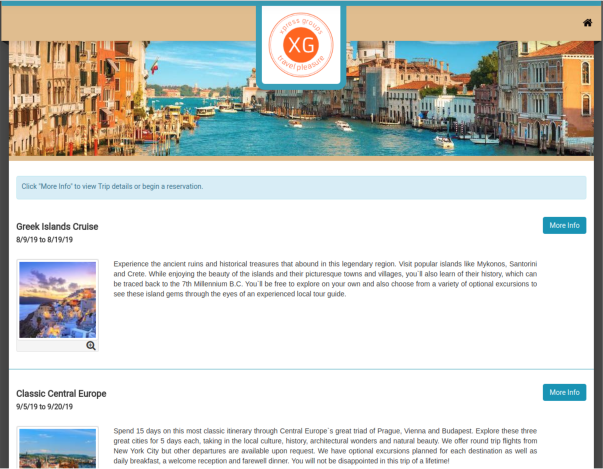 Or, customize each trip presentation with the included web templates or your own banner. Whether you offer cruises, bus trips, sports, faith-based or other specialty-themed trips, we've got you covered! Compatible GroupXpress is responsive. It is 100% functional on your Desktop, Laptop, Tablet, and Smartphone. If you are connected to the web, and have a Web browser, you can use GX. Easy to Use GX has an intuitive interface that requires no training. 85% of the tasks can be completed without even consulting the included Help system. But group travel, as you know, does have some complex operations and GX has broken those down into manageable, easy to follow, steps. Below is a link to a sample online customer registration site. Would you like to see how GroupXpress will look to your customers registering online? Click here to make a sample booking and see for yourself how easy it is for your customers to register for trips online using GroupXpress! Enter your name and agency info, and create a login to access the system to try it out - for free! Upon sign-up you will be placed on the Basic plan, which is our pay-as-you-go plan.You pay only when you are ready to Activate your trip and start selling!